The professionals at Middleton Heat & Air are dedicated to serving you and your family when you need us—even if that happens to be an evening after you get home from work, or over the weekend. We offer 8-to-8 Regular Rate, meaning we’re available to provide services to our customers at regular price from 8 a.m. to 8 p.m., 7 days a week. Middleton Heat & Air installs, services and replaces all major brand residential and commercial heating and air conditioning equipment. We’ve enjoyed serving Central Arkansas for over 40 years, and we’re committed to ensuring that our customers stay comfortable through every season. Our EPA certified technicians are trained to diagnose issues efficiently and offer affordable solutions. You matter to us not only as a customer, but as a person. 8-to-8 No Overtime is just another way we can serve you when it’s actually convenient, and save you the money you’d be spending on an after hours emergency service. Your family shouldn’t suffer through a scorching hot weekend, or below-freezing night because you don’t want to lose money or can’t pay out of pocket for an emergency service. 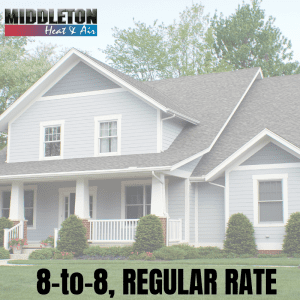 With Middleton, you don’t have to wait until you can leave work early in the day to meet an HVAC technician, or wait an uncomfortable weekend out. Give us a call any day of the week, and we’ll figure out a plan that’s right for you. We offer preventative maintenance, heating repair, air conditioning repair, ductwork and geothermal heating and cooling, among other services. We understand that living without heating and air conditioning isn’t pleasant, and we will do everything we can to get your HVAC system up and running with as little stress on you as possible. If you do have an HVAC emergency after 8 p.m., we also offer 24 hour emergency service 24 hours a day.